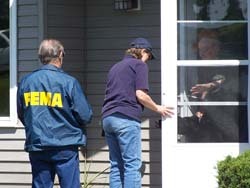 FEMA teams continue their tour of flood damaged Wisconsin. Damage assessment teams are were in Dane County Thursday, as they continue their work to determine what areas will qualify for a federal disaster declaration. FEMA&apos;s Hannah Vick says information gathered by the team will be sent to the Governor, who will use it to decide whether to request a declaration from the President. Twelve Wisconsin counties have already received a declaration, opening the door for federal aid in the form of FEMA grants or loans from the Small Business Administration. Vick says residents are urged to report any flood damage to FEMA by calling 1-800-621-FEMA (3362), even if they FEMA teams will visit more flood-impacted counties over the next several days.